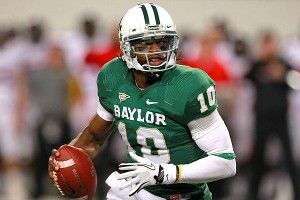 » RG3 Watch: Griffin the Cowboy? Oh mannnnn, it’s day three of the Robert Griffin III Watch, aka GRIFFINSANITY, and I haven’t slept for 72 hours. I’m just afraid I’m going to miss something, you know what I mean? What if there’s a crazy rumor? What if there’s a rumor that Griffin III and Eli Manning got in a fistfight at a McDonald’s, and now he’s going to the Redskins so he can have his revenge on the field for years to come? In fact, let’s make that an official rumor. I’m calling it. Eli, Griffin, McDonald’s, Redskins. Post it on your blogs because it’s as good as true. If you want a reason, just say that Griffin called the Shamrock Shake “total crap,” and Eli has a Shamrock Shake tattoo on his foot. Instant conflict. Chris Ryan was all, hey, maybe he’ll go to the Redskins/Browns/Dolphins/Eagles? I was like, what about the Chiefs and the Seahawks? So let’s see what’s up. The Rams have said they’re willing to trade the no. 2 pick well before the NFL draft in April. Shortly after the announcement, 300,000 creepy dudes with soul patches and those weird collared dragon flame shirts descended on St. Louis, claiming they could smell desperation. Two Washington Post columnists, Mike Wise and Jason Reid, debated about whether Griffin-to-the-Skins was a smart move. You’ll have to decide for yourself if this is a Wise Read. (AWWWWWWW SNAP! They’re lucky the Pulitzer doesn’t have a joke category or they’d just give me the prize now.) In addition, Mike Wise had the temerity to call RG3 “Rex Grossman III.” They better send him to whatever bunker Cheney used when things got bad in the District, because D.C. folks are swooning over Griffin. And apparently the Skins are willing to deal for him. SI‘s Chris Burke did the heavy legwork for us with a column about where the Griffter might end up. And man, does he throw out some names. Vikings? Worth pondering. Ravens? Flacco-yeah. Cowboys? Romo-kay. Jets? Sanchez-you-wish. Bills? Fitzpatrick-or-treat. Burke admits that he’s “spit balling,” but if I know the NFL (and I think I do) I would say that every single scenario he envisions will come true — over half the teams in the league will be quarterbacked by RG3. But wait a second … Jerry Jones and his son Steven think Romo’s the man. So hold the phone on the Cowboys. The Robert Griffin phone, I mean. The phone lines of delusion can be left wide open. Uh-oh, Buffalo may not be in either, if you believe GM Buddy Nix. Then again, why should you ever trust a guy named “Buddy”? He’s only going to hurt you. Griffin says his time in the 40 at the Combine may have been even faster than advertised, reports the Raleigh News & Observer. Apparently there may have been a mix-up with the clock or something, and the real time might be 4.35 instead of 4.41. Still singing your Romo tune, Jerry Jones? Jason Whitlock seems to be worried Griffin’s athleticism will actually be a hindrance. “He’s blessed with too many tools,” says Whitlock. Cool. Cool cool cool. That’s it for today. If you’ve got a hot Griffin tip, Griffin it in to GriffinGriffinGriffin@Griffin.Edu. Thanks for reading, see you tomorrow.